At the Liberal Chamber of Commerce/USD 480 Scholarship Awards Banquet KSCB and The Legend awarded the First annual Stu Melchert “Voice of Excellence” Scholarship. The award was presented in honor of long time KSCB General Manager and employee Stu Melchert. The scholarship was awarded to a qualifying applicant that plans to attend ant 2-4 year college or university that majors in journalism, preferably broadcasting. The Applicant must be accepted at a chosen institution and have a 2.75 high school GPA. The scholarship will be awarded at the start of the fall semester. 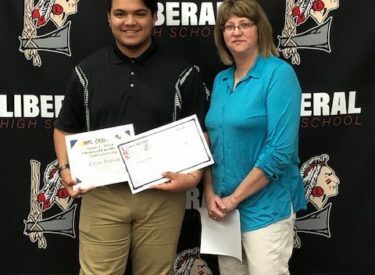 The $500 Broadcasting/Journalism Scholarship was awarded to Elvis Eduardo. Several thousands of dollars in scholarships were awarded at the Annual Banquet from various groups organizations and businesses throughout the community.